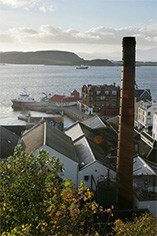 Oban distillery is one of the oldest in Scotland. Nestled in the very heart of the charming harbour town of Oban, it is the gateway and the last frontier between the West Highlands and the Islands, most notably the Isle of Mull nearby. Its history stretches back to 1794, when it was errected by the Stevenson brothers, Hugh, John and James, also founders of the city of Oban. In 1883 J. Walter Higgin bought the distillery. Between 1890 and 1894 he dismantled and rebuilt it bit by bit, in order to keep it in production - such was the demand for Oban's malt. 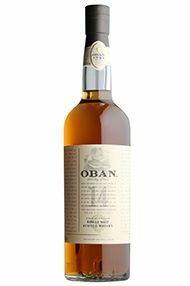 In contrast to many other distilleries created at that time, Oban has been produced as a single malt since the 1880's. Higgin carefully replicated the small stills and other traditional features in order to preserve the quality of the whisky. During the refurbishment in the 1890's, a remnant of Oban Bay's ancient beginnings was revealed when a cave containing Mesolithic human remains dating 4500 years BC was discovered behind the distillery (now on exhibition in the National Museum of Antiquities in Edinburgh). The Dewar's group became the owners in 1923 and it is nowadays part of the Diageo drinks group. The standard Oban style is a 14 year old malt which is rich and full-bodied with a mellow fruity finish and very light peat nuances. It essentially combines West Highland and Island malt styles, reflecting its geographical position between the two, as well as its temperate, rainy climate. Oban is the gateway to the isles and the only town to have its distillery on the High Street. The whisky shares a little of the highland and a little of the island style, there is a definite salty accent, delicate fruitiness and a good dry smoky finish.